Review written by Stijn “Metal Shredder” Daneels. My first encounter with Hell City took place way back in spring 2015 when they visited the Elpee Music Bar in Deinze as part of their Belgium/Denmark tour with Danish hard rockers Statement. Both bands did an excellent job despite the venue’s small size. Unfortunately, that gig also marked the first and only time I saw Hell City performing with their late bassist Michaël “Mike” Konovaloff, who suddenly passed away a mere couple of months thereafter. Three and a half years later I saw a completely rejuvenated Hell City play a headlining show at Pluto Metal Fest and now it’s finally time to get my shredding hands on their newest release! 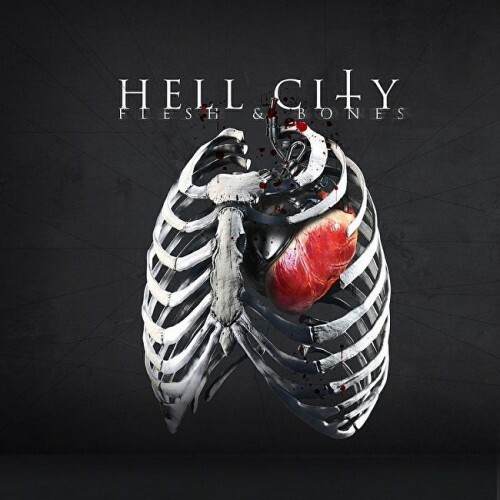 Flesh & Bones is the third studio album from the Belgian metal band Hell City. It’s released through Dutch record label Painted Bass Records and succeeds their 2014 album Victorious. The album continues and improves on the formula Hell City have been known for since 2007, a style that you can compare to other contemporary metal bands like Disturbed or Avenged Sevenfold. Classic metal song structures, highly melodic guitar riffs and solos, all tightened up by consistently rhythmic bass and drum lines. But one thing that makes Hell City’s sound more unique is the two very different vocal styles, often singing in tandem with one another. Of course there’s the band’s leading lady Michelle, singing in a natural, powerful voice about contemporary topics (such as social injustice, the fight for women’s rights and politics) but she’s often backed up by the harsh shrieks of Tommy, screaming in pure rage and agony. As a result, Hell City’s sound creates a down-to-earth modern metal style with some touches of power and thrash metal to create a sometimes quite dark but overall upbeat atmosphere. The band wants you to know that our world is going downhill but thanks to their energetic beats and engaging vocals, you can’t help but feel that, when taken appropriate action, the sun may shine on our world once again. First off, the album’s third track, “Your Darkest Hour.” It’s an excellent, bread-and-butter Hell City song but what makes this song stand out for me is the chorus, especially the way Michelle howls the line “Let Me Go” is very mesmerizing. Another favorite of mine is the “Flesh & Bones” title track, it’s the final and slowest song on the album, dealing with the dark subject of female sexual harassment and it showcases a more intimate and vulnerable side of the band for a very effective ending. Finally, there’s the seventh track, “BOGUS POTUS.” The fastest and heaviest song on the album (taking cues from thrash and even black metal) wherein drummer and screamer Tommy takes center stage as he screams and blast beats his way through this short yet epic track. A song full of anarchic rage and without Michelle’s vocals to provide some relief, this song evokes a much darker setting compared to the other songs on “Flesh & Bones.” And yes, this track deals with the politics of a certain US president we’re all familiar with. Personally I hate talking about politics but I do want to say that I prefer to tear down a wall (like another US president once famously said) rather than making one.